I was working on a new pet project for Windows 10 IoT Core. At this moment Win10 IoT Core is not supporting the Wi-pi Wi-Fi dongle. So I am using a Dlink 505 mobile companion to attach my Raspberry Pi b2 to my local network. This works great although Visual Studio has some trouble detecting the device. But because the default app (yes, this is just an app) on the Pi shows the current IP-address, I can simply submit that address when deploying (in the project settings). But when I deployed my own app I ran into a little problem. My Pi gets the current IP-address dynamically so at one point my deployment was not working anymore. The device had a new IP-address…. And this address is also needed for RDP so it is rather important. I wanted to read the current IP address in C# code so I could show it in my own app. This seems a bit trivial, but Google was not helping me this time. All examples were based on System.Net so that was not working. Then I was thinking, could it be that the default app is just open sourced? That way I could look in the code MSFT provided. And yes it is! Just go to the github location. So thank you MSFT for making the code available. 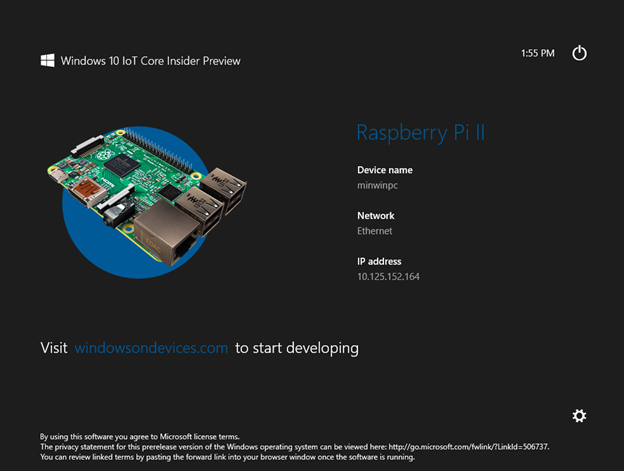 I was looking for a way to get my own Windows 10 IoT Core app started when my Raspberry Pi2 is rebooted. Must be replaced by your own app. The screen shown is the main screen from the ‘DefaultApp’ running. I stumbled across http://ms-iot.github.io/content/en-US/win10/samples/HelloWorld.htm which give a pretty good explanation on how to create and deploy an app on a Win 10 Core device. And there is a description on how to get my Pi started up with my app. The name of my app is App2 btw. So I tried ‘iotstartup add headed 7e3ab565-bbac-481a-86c8-12c991747ec2’ and it worked like a charm! epilogue: after the successful startup, I switched back to the default app and rebooted. But this seemed to force the Pi to reinstall Windows 10 IoT Core again (I was told to relax while the device was starting up with this nice circular waiting cursor). But this took a lot of time! So finally I put a new image on the micro-sd card but then the Pi was not booting anymore. I just got a red and green led running continuously. Did it die on me? Nope. I had another micro-sd card with Raspbian on it and the Pi started and worked fine. Then I tried my Windows 10 IoT Core again and now it rebooted correctly.